The art scene in the city of Winnipeg is thriving, showing itself in galleries, in classes and, more often, on the street! Vandalism does not differentiate between residential or commercial properties and neither do our Gorillas! Don’t take chances with questionable paint remover products when a professional Winnipeg graffiti removal service is ready and available. The longer graffiti is left to sit on your property, the more inviting it is for other street artists or taggers to leave their mark. Clearing away unwanted street art routinely can send the message to vandals that their work is futile. Any blank wall or space can be a canvas to the right eye, so it is important to be vigilant in all areas of your home or business. Speedy removal sends the right message but it can also lessen the damage to properties. If left over time, graffiti can bake into the facade of your property. Once this staining soaks into the surface, it becomes even more difficult to remove. Even the toughest stain doesn’t stand a chance against our Gorillas! If we can’t remove a stain with regular methods, we can paint over it! During our time in the industry, Gorilla Property Services has performed our graffiti removal services on every type of surface. In the same way the surfaces in your home require special attention – so do the ones outside! Instead of using only one form of graffiti removal, our Gorillas treat the staining on your property with solutions suited to the size and materials at play. Treating surfaces first with Gorilla Foam cleansers raises loosens stains so that more stubborn marks can be taken care of with pressure washing. Our multi-step process ensures that every trace of paint is removed without any further damage to the structure. 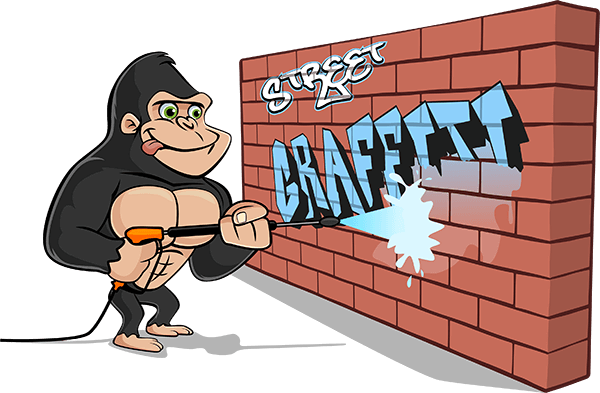 Property owners can rest easy knowing that even after our Gorillas are gone, they have left something behind: our anti graffiti coating! This coating can’t prevent graffiti from going on, but it makes it much easier to remove later on. When you find your property sporting an unwanted coat of paint, don’t hesitate to call in a Gorilla.